The see-sawing promo materials for upcoming SBS weekend drama The Time I Loved You is seriously giving me whiplash. It wouldn’t be as frustrating if the drama was just an original work, but it’s supposed to be the official K-adaptation of the popular TW-drama In Time With You, so the promos understandably take on an additional layer of scrutiny. I prefer the K-version deviate enough from the original to add its own spin and create its own mood, but not to the degree where its unrecognizable or ruins the core essence of the story. So far the teasers and stills have been a mixed bag, some stuff looks good while others don’t quite elicit a strong enough must watch reaction. 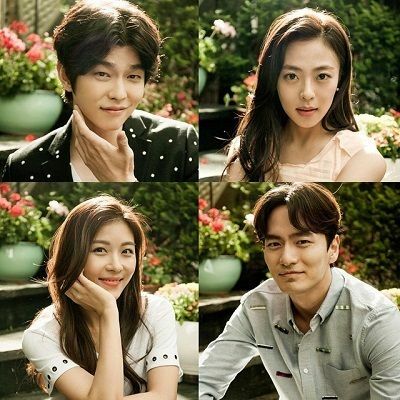 There is still another week to go before the drama premieres now that Divorce Lawyers in Love wrapped up this past weekend, I think the best indicator of yay or nay will be when I watch the long preview. Until then, the mood today is yay with the just released official dram poster featuring leads Ha Ji Won and Lee Jin Wook in an intimate moment of quiet contentment. I love this poster to bits, there is literally nothing even the slightest bit lacking in it from the connection to the framing. Love the poster! (and I not even a fan of the main actor) It goes well with the theme of best friends turned lovers. I keep feeling co flicked I whether it motto watch this drama..
Don’t you get spoiled by watching long preview? Just curious… Because that kills the fun of watching the first episode itself. I love the poster too! The ambience is just perfect, I love the soft, warm light to it. This poster is just soooo perfect! I’ve had nostalgic warm feels just by looking at it. HJW’s over LJW’s is just so romantic. You know, i never thought ha ji won was pretty, she always looked kinda old to me but for this drama, she looks absolutely beautiful, i am floored!! OH i love everything untill now including the teaser. i love both the main leads so it’s win for me. hope it will be good. didn’t watch ITWY so i don’t care if it’ll be similar or not.